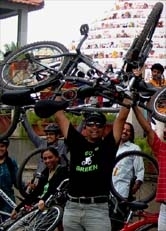 Go Green Campaign Ride towards Indranagar 04 April 2010 - GGI-Group size: 4000+ Professionals, Increasing on day to day basis, Come & join us 2 serve Mother Nature. This time 36 GGI members participated in the Campaign ride. We had decided to ride towards Indranagar Defense Colony where Mr. Kumaran and other GGI Members do stay. 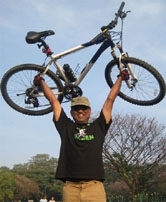 Started from RIS juction by 7:00 am and reached Cubbon Park by 7:35am. Vrishabh 10years old boy who joined along with his mother Cycled all along from Bilekhalli's Vijya Enclave (off Bannerghatta Road) and completed entire stretch of 38km's. Initially we were not confident but he was able to prove that we all were wrong. This was one of the best Campaign ride that we had and all credits goes to our GGI-Members suggestions of visiting different areas, specially Timm's. 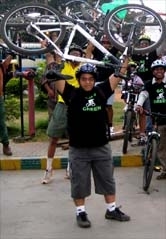 Our Next week Campaign Ride will be towards Malleshwaram and the Ride would be lead by our team member Shankar. Newbies : Sanjeev, Samarth, Vrishabh,Shilpa, Sukanya & Girish.